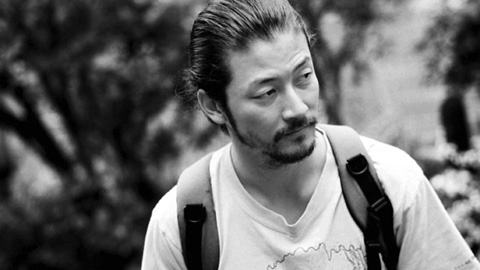 With the exception perhaps of Koji Yakusho, no actor has come to characterise recent Japanese cinema the way Tadanobu Asano has. 'The king of the indies', whose chiselled good looks have graced several dozen films and a million magazine covers, can increasingly be seen in bigger-budgeted films. But as Ichi the Killer and Electric Dragon 80,000 V attest, his sense for choosing roles with an edge hasn't diminished. I'd like to start by asking about the band you have with Sogo Ishii, Mach 1.67. When did you start this band and how did this idea develop? Actually that started after we made Labyrinth of Dreams together. At that moment we talked about starting a band. We recorded our first album doing covers of other people's songs. Through that band you were very involved with the creation of Ishii's film Electric Dragon 80,000 V.
Yes, we always knew that the main theme song and most of the music would be done by our band. We're certainly not limited to the kind of music that's in Electric Dragon 80,000 V, but it's one of the styles we dabble in as a band. You also did the calligraphy of the intertitles for that film. I know you paint and draw too. What meaning do painting, drawing, and calligraphy have for you? I have been drawing and painting since I was very young, so to me it feels very natural to do those things. It's the same with music. I joined my first band around the same time that I started acting, and the two have been parallel in my life ever since. I think my life would be no fun at all if I just had to act. So I try to meet people and have a good time through my music and then have that be reflected in my acting. You and your wife Chara are both musicians. Do you ever play music together? From time to time, but we haven't recorded anything together. We've also never played on stage. She's too tough for me, she's a real professional (laughs). You have become one of the most recognisable actors in Japanese cinema of the last few years, since you've been so very prolific. Aren't you afraid that this, plus the commercials you appear in, will create a kind of overkill? In Japan unfortunately our movie audience is not big enough for my performances to become overkill. Not enough people go to see Japanese movies for that to happen. I have the impression that the range of parts you play these days has become more diverse. There could hardly be a greater contrast between Ichi the Killer and Distance for instance. Do you feel you have gone beyond being typecast? I would say that the kinds of roles that get offered to me are still fairly specific. What about a film like Gohatto? Did you see that as an opportunity to diversify a bit? I don't really think of my acting in that way. Did the international potential of an Oshima film have something to do with your decision to do that film? It was really about the possibility of working with Oshima and Yusaku Matsuda's son Ryuhei that appealed to me most. You made a film in Hong Kong with Christopher Doyle - Away with Words - and a commercial and a short with Wong Kar-Wai. Are there any plans for a feature film with Wong Kar-Wai? I would love to do it, but there are no concrete plans. We certainly brought up the idea when we made the commercial together, but nothing has come of it yet. Ichi the Killer and Electric Dragon 80,000 V are both quite extreme films in their own unique ways. Why did you choose to play in what could be seen as quite risky films for an actor? I always really wanted to take part in a very wild role in one of Ishii's films. As soon as I read the screenplay, I wanted to do it. Because we're also in the band together, Ishii knows very well what I'm like day-to-day and I feel that he used that as a director in working with me, a real knowledge of me as a person. Hopefully I'm not as whacked out as Dragon Eye Morrison, but he'd seen my performances and based part of the character on my performances. When I heard that Takashi Miike was doing Ichi the Killer, I decided I had to be in it. I was a huge fan of the original manga on which it was based. Was there any intention on your part of shattering the image that people have of you? Not intentionally, but I guess if that's the effect than it's all right. How was the experience of working on Ichi the Killer? Did the violent nature of the story trouble you in any way? Miike really is such a prolific director, he is so relaxed on set and everything went so smoothly, that it made me feel very comfortable. I realize that it looks very bloody on the screen and even with the original manga you want to close your eyes in several places. But actually the set was very much of a world apart. I sensed something very special and unique, and something that never felt unsettling to me when making that film, so I was very comfortable with portraying the violence. It was a very easygoing atmosphere on set and we really had a fabulous time making the film. And how would that experience compare with making Distance with Hirokazu Kore-eda? Distance took the very unusual approach that each of the five actors only had a script that was pertinent to our own part. So it was a very different experience on set, with the director trying to give birth to something through that process. It was very different altogether and a little bit slower. Generally I would know the questions I was supposed to ask the others, but had no idea as to how they would react. We each had our own lines and sometimes on purpose those would be the wrong lines, with the intention to trip us up in our performances. You've worked with some of the best directors in Japan today. Is there anyone you would still like to work with? I really don't watch enough movies to have an opinion, but I really look forward to someone like a Shinji Somai emerging from today's younger directors.